When the most powerful weapon in the land of Prydain falls into the hands of Arawn, Lord of the Land of Death, Taran and Prince Gwydion rally an army to stand up to the dark forces. The companions' last and greatest quest is also their most perilous. The biting cold of winter is upon them, adding to the danger they already face. Their journey, fraught with battle and bloodshed, ends at the very portal of Arawn's stronghold. There, Taran is faced with the most crucial decision of his life. 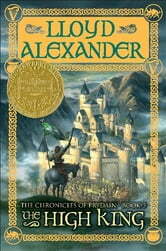 In this breathtaking Newbery Medal-winning conclusion to The Chronicles of Prydain, the faithful friends face the ultimate war between good and evil.